Excellence meets performance…. The all-new 70 Princess boasts breathtaking lines, innovative use of space and a Flybridge that has both function and form. The 70 Princess not only prides her self on superior performance and ride but on accommodations like the separate access to a full beam master. This combination makes for a comprehensive, well rounded and extremely well received Flybridge Motoryacht. The all new 70 is so well received that you can expect wait periods of over a year. Take a moment and get to know Isa-Life, it's an extraordinary example of better than new condition, fully rigged, outfitted, and ready for its next owner. With the current owners change of plans take advantage of this opportunity for a turn key vessel of this status. This captain and crew maintained 2019 70 Princess has low hours and carries the balance of 5 year MAN ESC warranties. With her Seakeeper SK16, custom upgrades and a Williams Jet Tender it makes for a must see for those in the market seeking a performance Flybridge MY in the 70 foot class. This vessel will be easy to show in Palm Beach and on display with Galati Yacht Sales at the Palm Beach International Boat Show. Make an appointment today. Emerald Coast Marine is pleased to assist you in the purchase of this vessel. 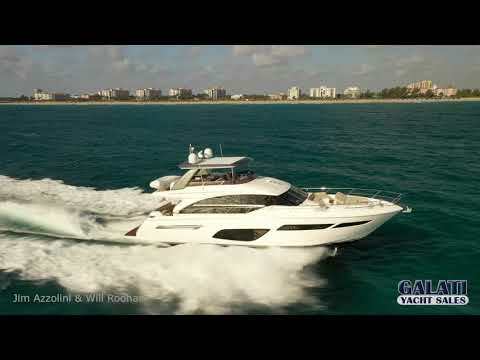 This boat is centrally listed by Galati Yacht Sales Destin. Audio/Video Communications: 49” LED TV in master on powered lift mechanism with Harmon Kardon 2.1 Blu-ray system. VHF 300. External Garmin GPS antenna connected to Garmin network.